RADIANT FLOOR HEATING – Senergy Mechanical Inc.
Radiant floor heating involves heating the floor through a series of plastic pipes that run underneath it that carry warm water. The water radiates heat and warms the floor which in turn warms the room. Having pipes running underneath the floor is the most common form of radiant heating but there can radiant heating pipes in the walls and ceiling as well. 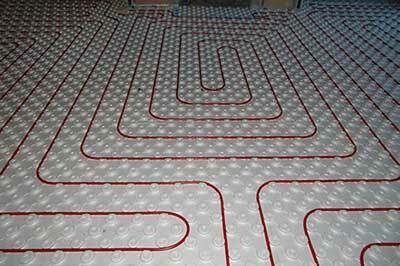 Radiant heating pipes can be installed underneath any kind of floor: wood, tiles, carpet, linoleum, concrete. The most efficient one would be for tiled floors as they retain heat the best and tend to need heating because tiles can be cold. Materials such as wood and carpet require a higher temperature setting for the same effect. Heated floors have been used since ancient times by different cultures ranging from the Romans to the Koreans dating back to 2000 years ago. It is no wonder why this practice is continued today. Now with upgraded and perfected technology heated floors have become the most efficient, economical and eco-friendly heating option. Radiant floor heating offers many advantages compared to traditional air-duct heating. The main advantage is even heating throughout the room. Often times the temperature can be different on one side of the room compared to the other. Due to air-duct placement, drafts, and openings such as doors or windows hot air moves inside the room, rises and escapes. Radiant floor heating focuses on heating the room from the floor up distributing an even temperature near the floor where humans are. This ensures a uniform temperature throughout the room while eliminating drafts. By running water through pipes the system runs without making any noise, a contrast to noisy furnaces, ducts and fans. This eliminates disturbances and makes warming the house or room unnoticeable. Another bonus is that radiant floor heating is clean. Since the heat is not transferred by air, there is no dust, dirt or airborne bacteria being blow throughout the room. For this reason radiant floor heating is the ideal option for people with allergies. Radiant floor heating does not require any air ducts or vents, making the room more aesthetically pleasing and solving issues with furniture placement that occur when air ducts cannot be blocked (unrestricted furniture placement and more usable space). Traditional heating involves setting the entire house to the same temperature, whereas with radiant floor heating different room can be set to different temperatures based on their traffic. Seldom used rooms can have a lower temperature setting than frequently used rooms. This makes radiant floor heating the most economical option for heating while reducing your energy bill.